I have never really cared for the conversational opening line, "So, what's new with you?" I realize it's a reasonable way to begin a conversation, but I tend to feel put on the spot, as if the question is loaded with an expectancy for something out of the ordinary and requires an equally out-of-the-ordinary response. Now, I have to admit, although my life has its ups and downs, and its lion's share of beautiful moments and seasons, it is also quite ordinary much of the time. No, we haven't been away on an exotic holidays recently; nothing untoward has happened to me or anyone I know; and the little joys and pleasures -- or the minor trials I may experience in my every day routines and rituals, alone or with others, don't seem to be the fodder for casual conversations. Of course, I could tell the person how I enjoyed playing with my kitty cat as she chased the string around the room. But, first of all, it's not new information, and second, the person, unless a tried and true cat friend, probably isn't going to be as eager to know whether Miss Kitty played with her toys today or not. "What's the best thing that happened to you today? This is one of my favorite questions to ask people in lieu of the overused and often insincere, "How are you?" It's a simple, thought-provoking question. Ask it of others -- and once a day, ask it of yourself. In my seminars and workshops, I often have participants ask each other, "What's the best thing that's happened to you today (or this week or this month ...)?" Most people have to think for a moment, but the response is always one that lifts spirits and puts life in a whole new perspective." Now, doesn't that question create more opportunity for interesting conversation? To share more heart stuff? Now let's see, the best thing that happened to me today was when I went for a little walk in the neighbourhood. I enjoyed that it was lovely out and that I could smell all those earthy Spring smells and listen for the bird songs of the newest arrivals. I even chatted with a chirpy sparrow when I passed the tree he was perched in, imagining that we actually shared a magical moment together. So, what's the best thing that happened to you today? had success in my ancestor research and some clues in where to find them.. I know that I told you this before, but your eye for color and your artistic abilities sure do make it a joy to visit this blog. I really like your banner picture with the bright yellow and vibrant blue. I also like this post. 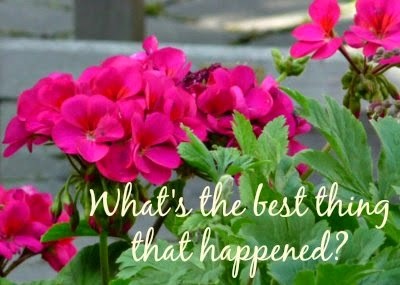 It is a good question..."what is the best thing that happened to you today?" It is what my daughter and SIL ask their children each night at dinner. In their 2 and 3 year old way, they eagerly answer the question. I really like this idea. Thanks for sharing. Hope your Monday is a good one! So far, it may have been reading this post. Thank you! I love this question! I can see it coming up in class this week! Thanks for the idea! I love the spring look, too! The best thing that happened to me today was seeing the sunshine shine through the rain clouds inbetween the bursts of rain. Well one of the best things that happened to me today was opening my email and seeing that beautiful comment you left for me! Thank you so much!! I've enjoyed reading through your blog, and am sure to visit again soon!